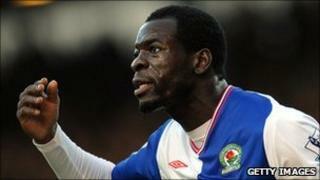 Premier League footballer Christopher Samba has been fined £120 for speeding in his Rolls-Royce in Lancashire. The Blackburn Rovers defender was caught on a speed camera driving at 46mph in a 30mph zone in Blackburn Road, Darwen, on 17 January. He was returning from the club to his home in Stockport, Greater Manchester, at the time of the offence. Mr Samba, 26, was also ordered to pay £50 costs and a £15 surcharge at Blackburn Magistrates' Court on Friday. The French-born Congo international, who did not attend court, pleaded guilty to the offence and was also given four penalty points on his licence. In a letter, he apologised for speeding and told magistrates he would be "more diligent in future". Mr Samba was originally summonsed over his failure to identify who was driving his car at the time of the offence. He claims he did not receive the notice but accepted he was driving the vehicle. Former Rovers boss Mark Hughes signed the towering defender from German club Hertha Berlin for £400,000 in January 2007. He made 30 Premier League appearances last season and signed a new contract which ties him to Ewood Park until 2014.